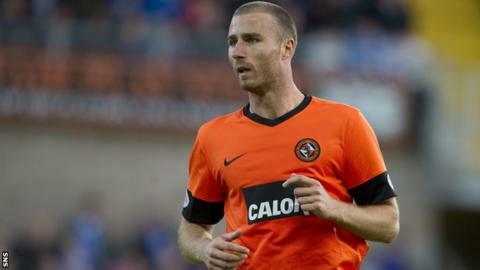 Dundee United defender Sean Dillon has signed a contract extension, which will keep him at Tannadice until May 2015. The 29-year-old Irishman has made more than 200 appearances since he joined United from Shelbourne in January 2007. "The progress the club makes each year gives you a real buzz," said Dillon. "I love being at Dundee United. "My desire to continue to improve personally as well as improve the club's fortunes made signing the extension an easy decision." Dillon, who can play full-back or in central defence, was a member of the 2010 Scottish Cup final winning team. United manager Peter Houston said: "Sean is a model professional who has a great impact on his fellow players both in the dressing room and on the pitch. "His versatility is also a great option to have although over the last few years he has cemented his place in central defence. "It is so important to Dundee United that we have experienced players in the team alongside the developing youngsters and Sean's experience is as vital as his excellent footballing ability."